Mary got in touch with me to work on a beautiful and unique memoir by New Zealand author Emma Gilkison. When I first heard the brief I thought, oh my goodness, where do I even start with this subject matter? It was a wonderful challenge. 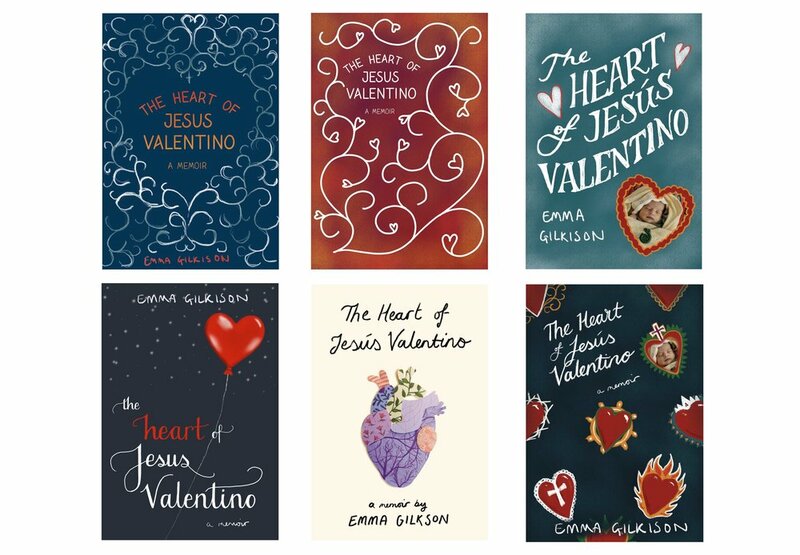 The Heart of Jesus Valentino is a memoir of love and loss. Emma Gilkison and her partner found out they were pregnant after a year of trying. They are absolutely delighted until something unusual turns up on the ultrasound. Their baby had an extremely rare medical condition called ectopia cordis, a usually fatal circumstance where the heart grows outside of the body. This memoir follows their journey as they make the difficult decision not to terminate the pregnancy and continue knowing their child probably wouldn't survive more than a couple of days. The Heart of Jesus Valentino is a grief memoir, a medical memoir and a philosophical exploration of life and death. Mary and Emma both wanted this book to be colourful and uplifting. I had a phone conversation with Mary discussing potential images. They were interested in bringing in some religious symbolism to represent the spiritual journey they went on over the course of the pregnancy. Mary sent through some photos that could be used alongside lettering and/or illustration, as well as some images that Emma had found inspiring. All of the concepts used heart imagery in some way, mostly as a stylised love heart, but I also experimented with making a more anatomical heart cut from paper with different patterns on. Mary and Emma liked the more pattern-like design (bottom right, below) but asked if I could add in more floral motifs such as roses, and a chaffinch that appears in the text. I experimented with different ways of putting the birds and flowers together. I added some lilies and a lotus flower as subtle references to Christianity and Buddhism. Both were religious teachings Emma and Roy explored during the pregnancy. I played around with various ways of arranging the flowers and put the larger heart shape in behind the text to frame and accentuate it. Finally, we looked at the colours. I liked the more muted colours, but Emma and Mary wanted a more Latino colour scheme to reflect Roy's heritage. Some of the colours I tried were almost fluro, and a little much given the subject matter, so we reached a compromise with the brighter blue and vibrant reds. The final cover is bright and really stands out in bookshops. With the cover complete it was time to put together the final spread. I used the same Chaffinch design shrunk down on the spine. Seeing as the book would spend most of its time spine-out on a bookshelf I thought it important to give it an extra little detail. Likewise, I wanted to make the back and flaps more interesting than simply a plain blue background, so I copied the outlined border from the front and echoed it in a shade of blue slightly lighter than the background. I discovered later in the project that there was a budget to print on the inside of the jacket. It was going to be a plain cream colour, but I added a repeat pattern featuring the bird from the cover. Given how busy that cover was, there wasn't the need to have an elaborate endpaper design, but this is quite subtle and simple, and reminds me of the kind of wallpaper you might see in a child's nursery. Interested in working with me? Click here to get in touch.